Chest carved 1920 for Philip Hudson . Who was Nellie Payne? Chest carved for Philip Hudson. Philip Burgoyne Hudson was born in Auckland, New Zealand on 6th February 1887 and died in 1952 at the age of 64. He was the son of Charles Hudson, Railway Commissioner of Victoria. As a child he attended Wellington College in New Zealand and moved to The Friends College High School to continue his education in his early teens. In 1903 Hudson moved to Melbourne and attended Melbourne University to pursue a career in Architecture. In 1904 Hudson was articled to Anketell Henderson and began a practice with D’Ebro from 1904 to 1909. In 1909 he started a practice of his own. Hudson also began teaching architectural drafting with Harold Desbrowe-Annear and Haddon at the Working Mens College, now known as RMIT University. A year later, he met Ethel Elise Vincent and was married on 14 December 1910. Ethel gave birth to one son and two daughters and lived in their home in Garden Vale which was designed by Hudson himself in 1914. He served in the war and moved on to study under Charles D’Ebro. Hudson and Wardrop was formed by Philip Burgoyne Hudson and James Hastie Wardrop in 1919. The Australian established architects are well known for their designs of chapels, universities, colleges, factories, hotels, and public monuments in Melbourne, the Shrine of Remembrance being the most prominent out of the few. 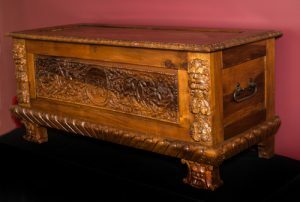 This dower chest was donated to or purchased by the Queen Victoria Museum in 2010 and we acknowledge and thank them for allowing this item to be displayed here. This Dower Chest was carved for Philip Burgoyne Hudson. The inscription inside the lid reads, ‘TO PHILIP BURGOYNE HUDSON IN MEMORY OF ALAN FIELD PAYNE & OF A FRIENDSHIP FORMED ON THE BATTLEFIELDS OF FRANCE 1917-1925’. Richly carved with Renaissance-influenced motifs, this dower chest is an excellent example of Ellen Nora Payne’s distinctive work and a fitting acquisition to be supported from the Toni and Peter Bessant Fund. Philip Burgoyne Hudson, a friend of Ellen Nora’s youngest son Alan, became a well known Melbourne Architect. He was educated in Wellington College New Zealand, moved to Hobart where he attended the Friends College High School and later moving to Melbourne where he studied at Melbourne University. He joined the 5th Field Company engineers during the First World War. Hudson’s friendship with Alan Field Payne blossomed during the war, becoming firm friends. The chest was carved after Alan drowned aged 29 in Gippsland, Victoria.